When I started guiding, I was under no illusion that my life would now consist of fishing all of the time. There is a common misconception that guides get paid to go fishing. While that is true in a sense, they are not the one holding the rod. 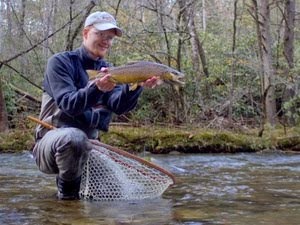 Fishing through another person is an even greater challenge than just doing it yourself, but one thing seems to be consistent with fly fishing guides: they don't fish while with paying customers on a guided trip. Some people are surprised when we begin a trip and I only rig up a rod for them. Of course the temptation to fish is strong, particularly when they announce that they "don't mind" if I fish, however I try to stay strong. The rare occasions I pick up a fly rod are to try and demonstrate something, or occasionally if we are on a lunch or water break. Earlier this summer, I was reminded why I don't fish with clients during a water break high up Little River above Elkmont. We had been fishing hard and catching a few here and there, but not as many as I knew we should be. When we stopped for a quick break for water and a "trip to the woods," I grabbed the rod (my own rod we were using) and tossed it into a nearby pocket. 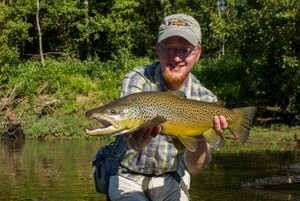 I quickly hooked and landed the largest brown of the day at around 11 inches and was thoroughly reminded why I don't fish with customers along. Fast forward to last week, and I am out on the boat with my friend Gary on a guide trip. Gary is a very good fisherman and is always a joy to have on the boat. He can cast efficiently and generally catches plenty of fish and also provides good conversation. 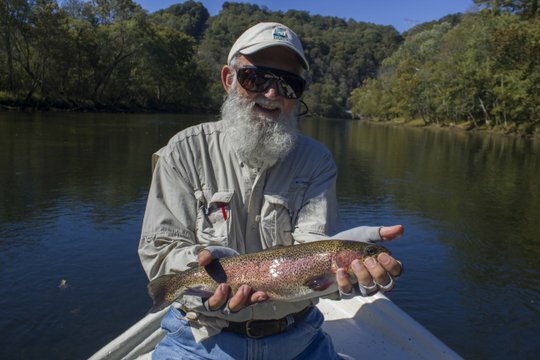 We were having a good day already with a nice rainbow already landed in addition to the smaller usual fish. Nearing lunch time, I was about ready to pull for the shade near shore but since we were drifting towards some good structure, decided to let things go a little longer. Sure enough, the indicator shot down and the battle was on. 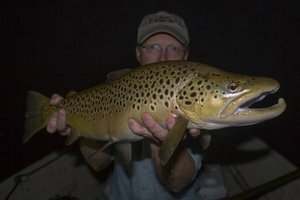 Gary did a great job fighting this big trout and before long, we were admiring a big brown trout in its finest fall colors that just happened to be Gary's largest brown ever. Feeling good about how the day was going, we moved into the shade and enjoyed lunch. 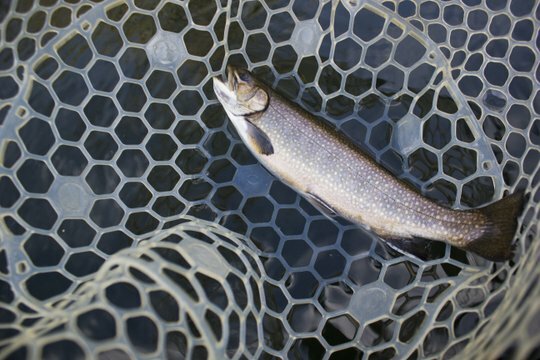 After lunch, we started drifting again and quickly picked up a couple of trout and that is how the day would continue. Drift a little to find good structure and moving water, toss out the flies, catch a few fish. By the time we approached the main point in time that this story is about, it was getting late and we only had an hour or so left. I had pulled in close to shore and dropped anchor. Just below the boat and over a shoal some fish were rising steadily and at least one looked like a good fish. I watched Gary cast a while and realized that a good pile cast would allow the extra drift needed to get an eat by one of those fish. Offering to show him the cast, I grabbed the rod (again, my rod we were using) and made a couple of casts while talking about the benefits and technicalities of the cast. On the third cast, I pulled the line out of the water hard for one more cast towards the middle of the river to demonstrate one last point but ran into what felt like a concrete anchor on the bottom of the river. Somehow, even though I was not "fishing" or watching my flies, a fish had taken the midge and was determined to keep it. Going through the whole fight routine, I just kept thinking to myself, why did I ever pick up the fly rod? 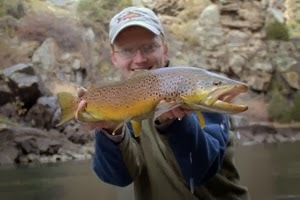 This soon was followed by telling myself just don't touch the fly rod anymore on guided trips. 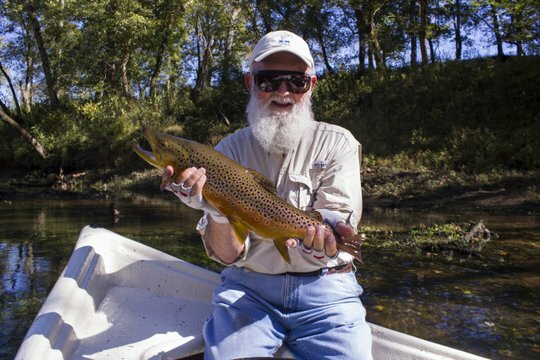 Seriously, how do you catch a big trout without even trying? If it hadn't of been for leaving flies in the poor trout's mouth I probably would have just broken the fish off at that point. The rest of the trip down the river, Gary didn't forget to rib me about my catch, and I know it is definitely one I will not live down. 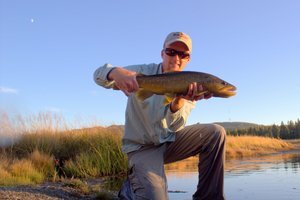 So, for those of you who have fished with guides, do you appreciate having a guide demonstrate (not truly fish, just demonstrate) techniques or prefer to leave that for non-fishing times? Perhaps I should carry a rod strung up without any flies or maybe a dry fly with the hook point cut off. I still need to figure this thing out because I believe there are times that a demonstration is the best way to teach, but I can't keep catching fish that should have been the customer's even if it is all accidental. The rest of our trip was successful despite the much-deserved teasing I was getting from Gary. We found a brook trout to complete his first ever slam or Caney Fork Hat Trick as I like to call it. The day ended with an amazing sunset. 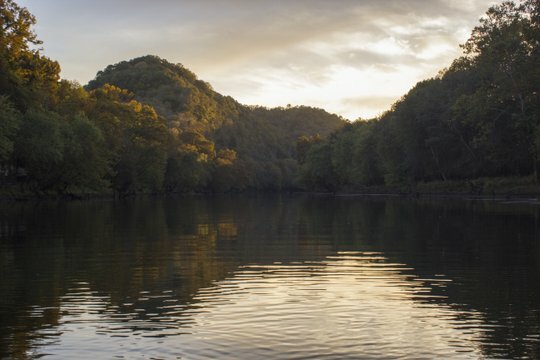 If you are interested in a guided trip, feel free to call/text me at (931) 261-1884 or check out my guide site, Trout Zone Anglers, for more information. It's my opinion that the guide shouldn't fish. He's there to make sure his/her client catches fish. If I'm fishing with someone new, I try not to fish (even though I'm not a "guide") so they have the best chance of catching. On the other hand, sometimes that creates a fly fishing monster ie. Juan Lopez and now Yuki. Mark, I'm with you on this one. I'm still struggling with how to demonstrate concepts without accidentally catching trout though.